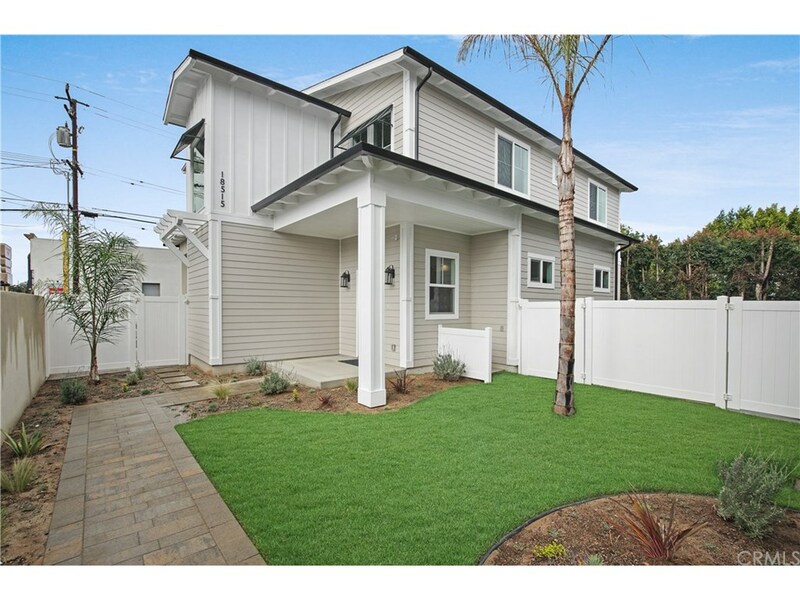 NEW CONSTRUCTION in Torrance...private with upgrades and lots of square footage! This beautiful, open, "Modern California Craftsman" is one of two astounding, free-standing homes with aprox 2,460 sqft (per Architect plans.) You'll fall in love with the wide open, bright and beautiful floor plan as soon as you open the front door! The dramatic, 10 ft ceilings on the main floor & open floor plan accommodate the living/dining areas, kitchen with built in cook top & "color quartz" counters, sparkling tile backsplash, white ceramic farm house sink and Kitchen Aid stainless steel appliances. Need office space? The flexible floor plan can also provide extra room for a home office/workspace. The modern, iron guard rails lead you upstairs to the second floor with 4 bedrooms including the master with private bath, dual vanities, separate bath & shower, a second bedroom with private en suite bath, 2 additional bedrooms and 3rd full bath with color quartz counters and brushed nickel fixtures. The 9 ft ceilings with modern ceiling fan/light fixtures complete each bedroom. The private, covered patio with gas hook up for outdoor entertaining and turf provide a quiet and soothing yard for entertaining or peace of mind after a long day. Some of the "invisible upgrades" include a tankless water heater, Pex plumbing, Liftmaster belt driven/insulated garage door, conduit prepped for solar panels & more! Close proximity to shopping, restaurants, Columbia Park & award winning Torrance Schools.